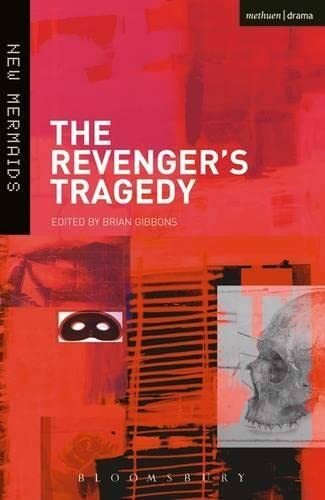 The Revenger's Tragedy, published in 1607/8, a renaissance tragedy, has been credited to various authors, including Cyril Tourneur, Brian Gibbons, Thomas Middleton, and perhaps most accurately, "an unknown Jacobean dramatist." Renaissance tragedies generally involve monarchs or nobles, violence, and the death of the protagonist. Plenty of all that here. The "revenger" of the title, Vindice, plots to murder the Duke who poisoned his fiancee for refusing to become his mistress. By the end of the play, most of the male characters, including Vindice, are dead. This is not a spoiler; Jacobean audiences would have known to expect it. I have no experience with the genre, but I found it very reminiscent of Shakespeare, particularly in its language. It even opens with Vindice carrying the skull (!) of his murdered sweetheart, brooding on "the bright face of my betrothed lady, /When life and beauty naturally filled out /These ragged imperfections... " and nursing his plan for revenge. The author plays with the names; not only Vindice (the revenger--get it? ), but all the Duke's sons have Latin-sounding-but-made-up names that reflect their characters: Lussorioso, Spurio, Ambitioso, and Supervacuo. There is even a hanger-on called Sordido. Not a nice family, you might think, and you'd be right. They seem to have been a scourge on the local womanhood--between them they have multiple rapes and murders to their credit. I can't say that I cared very strongly about the characters--they were "types" more than human beings. The innocent virgin, the calculating mother, the evil seducer, the avenging brother/lover. But my impression is that these types are among the conventions of this very stylized type of drama, along with the violence, scheming, and death. Its language, for me, redeems it--graceful, and full of lines that stick in my memory, from the famous "Hell would look like a lord's great kitchen without fire in't," to the cynical "A duke's soft hand strokes the rough head of law, /And makes it lie smooth," to the despairing "Why does not earth start up /And strike the sins that tread upon it?" Wonderful, memorable lines are easy to find in this play, which makes it very much a worthwhile read. What a great review this is! It tempts me with information (love the quotes) yet it keeps me questioning: why have I never heard of a Jacobean playwright other than Shakespeare? I see you have 9 plays on your classic list. Any reason why you include so many, or just a personal preference. I plan to add Julius Caesar (Shakespeare) to my Classic List so I can use my historical knowledge (Caesar's Women) to enhance the pleasure of reading the play! Interesting that you should mention Julius Caesar. We've just started reading it. I'm in the opposite position to you--I have no extra knowledge of Roman history. Someone told me that Shakespeare took his info about Caesar from Plutarch, so I'm reading that section in Plutarch's Lives while I read the play.